A high-energy rocket is largely responsible for advancing the quest for knowledge and revolutionizing global communications. Its name is Centaur, and it is America’s Workhorse in Space. Centaur is one of NASA Lewis’ (now NASA Glenn) most significant achievements. Centaur has been used to boost satellites into orbit and propel probes into space. It has helped to revolutionize communication and expand the frontiers of space. In all, Lewis used Centaur for more than 100 unmanned launches. In 1957, almost one year before Congress created NASA, the Air Force studied an exhaustive proposal from General Dynamics/Astronautics Corp. to develop a new space booster that could give the U.S., in the shortest possible time, a means of orbiting heavy payloads. That vehicle was to become Centaur, a high-energy second stage with a new propulsion system using liquid hydrogen. Mixed with liquid oxygen, this new fuel afforded the promise of boosting payloads as great as 8,500 pounds. By August of 1958, the Government’s Advanced Research Products Agency accepted from the Air Force a more elaborate proposal for the Centaur and assigned authority for its development to the Air Force. Centaur promised new muscle in space. The U.S. needed it. The Soviet Union had taken the lead with the very first space flight; Sputnik I launched into Earth orbit on October 4, 1957, its “Bleep, Bleep” being heard around the world. Centaur became an official hardware development program the same year NASA was established, in 1958. At that time, the heaviest Soviet satellite orbiting Earth was the 3,000-pound Sputnik III. Reflecting long-range U.S. space strategy, on July 1, 1959, NASA took over the jurisdiction of Centaur from the Department of Defense. Soon after, the first Centaur flight test was set for January, 1961. Centaur was not to be just another booster, but the rocket by which NASA would conduct extensive Earth orbit missions, lunar investigations and planetary studies. Aside from military satellite missions assigned to Centaur, which were to be considerable, NASA planned to launch one operational Centaur every month for a period extending well into the 1970’s and beyond. That schedule became hopelessly over-optimistic, dogged by an avalanche of problems, failures, test-stand explosions and other delays. On May 8, 1962, the first Centaur rose, a perfect launch for the first 54 seconds. Then, the Centaur upper stage exploded. DoD officials became convinced that operational Centaurs would not be available until 1966. NASA rescheduled another flight test for October, 1962. Now, Dr. Abe Silverstein stepped forward and convinced the hard-pressed NASA organization that his Lewis Research Center could de-bug and manage the problem-ridden Centaur. Full responsibility was assigned to Lewis under Dr. Silverstein, its second Director. Engineers at Lewis were familiar with the Centaur’s liquid-hydrogen/liquid-oxygen cryogenic fuels, having developed the technology for safe handling of the -400 degrees F propellants. Long before NASA was created, Lewis conducted pioneering work on the high-energy liquid propellants for rockets. This included, in the late 1940’s, accumulating valuable test data that became the technical base for the space age. Successful tests produced the ramjet and rocket technology that were later to carry men and machines at incredible speeds through the atmosphere and beyond. For more detailed information on this topic, please refer to Liquid Hydrogren As A Propulsion Fuel, 1945-1959 (NASA SP-4404, 1978). Given a go-ahead, Lewis engineers perfected the workhorse booster, carrying out a complex research and development program to assure its reliability. To make certain of Centaur’s success, the Lewis team also perfected and improved the Atlas booster, which would carry it off the pad. Special facilities were set up for ground testing both rockets at Lewis’ Plum Brook Station in Sandusky, Ohio. Finally, on November 27, 1963, it happened. NASA had its first successful launch of the first Atlas/Centaur. No payload was carried, but the powerful rocket scored a significant milestone: first in-flight burn of a liquid-hydrogen/liquid-oxygen engine. Major successes followed rapidly. 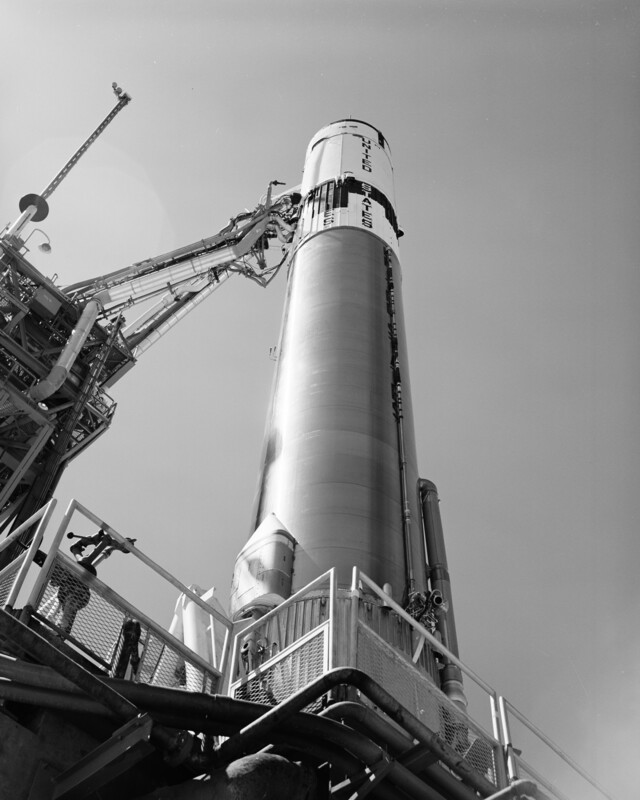 The Centaur rocket was this nation’s first high-energy upper stage launch vehicle. Most rockets burn kerosene based hydrocarbon fuels, but the Centaur uses a liquid-hydrogen/liquid-oxygen propellant combination. The high energy provided by this combination results in a greater specific impulse for the rocket. This means more thrust or pushing force is provided for each pound of propellant burned every second. Specific impulse for a rocket is somewhat like miles per gallon of a car as a measure of fuel efficiency. This is important, since the weight of the propellant is a large part of the total weight of a rocket system. The original Centaur rocket measures 30 feet long and 10 feet in diameter. Fully fueled it weighs more than 35,000 pounds. Use of the high-energy propellant combination on the Centaur meant heavier payloads could be carried into orbit. Payloads weighing as much as 5,000 pounds could be carried to high Earth orbit in combination with the Atlas first stage. At General Dynamics in the San Diego area, the Centaur was assembled. Because the Centaur rocket used very cold propellants, the tanks require special construction. The tank was separated into two compartments. One contained liquid hydrogen and the other liquid oxygen. At -297 degrees Fahrenheit, liquid oxygen is extremely cold but still much warmer than the -420 degree temperature of liquid hydrogen. To prevent the liquid hydrogen from boiling off, General Dynamics designed a double walled bulk head, which serves as a heat barrier. It also acts to separate the two compartments. The liquid hydrogen compartment is covered with light-weight insulation. It protects the tank from the intense aerodynamic heating experienced during the rocket’s flight through the earth’s atmosphere. The insulation prevents further boil off of the cold fuel inside the tank. The tank must be built to withstand the stresses of flight. The tank is made of very thin stainless steel, less than 200ths of an inch thick, or thinner than a dime. Although the tank is extremely thin, once pressurized, it is light-weight, yet rigged like a football. The rocket is equipped with two main engines. Designed by Pratt & Whitney Aircraft, each RL-10 engine produces 16,500 pounds of thrust for a total of 33,000 pounds. Many liquid fuel rockets burn some fuel to run a fuel pump but with the RL-10 engines this step is eliminated, thereby conserving fuel, which instead can be burned to produce added thrust. The RL-10 has proven to be a very successful engine. It was the forerunner of the liquid-hydrogen/liquid-oxygen class. The technology was incorporated into the J-2 engines which were used on the upper stage of the Saturn rocket for the Apollo. The technology has also been utilized in the Space Shuttle Main Engine, which use liquid hydrogen and liquid oxygen. Another important feature of the RL-10 engines is that they are capable of making multiple starts after long coast periods is space. The advantage is accuracy. Its like an outfielder in baseball trying to throw a base runner out at home plate. By throwing the ball to an infielder who relays the ball to the catcher at home plate, the ball is given a mid-course correction. The result is improved accuracy compared to one long throw from the outfield. When the target is 3 billion miles away instead of 300 feet away, the accuracy is that much more important. Besides the two main engines, which produce the thrust to power the Centaur, several other small thrusters are fired to steer the rocket. These small thrusters are part of the Reaction Control System, or RCS. The RCS maneuvers the rocket in response to commands given by the Guidance and Control System. All of the components including the propellant tanks, engines, navigation and computer systems are thoroughly tested. Reliability and quality must be guaranteed before a rocket is committed for use on a space flight. Assembly of the rocket system was done at General Dynamics in San Diego. After passing final acceptance inspection, the assembled rocket was shipped to the eastern test range at Cape Canaveral Air Station. Upon arrival at the Cape, engineers and technicians perform ground tests and operations to ensure the rockets reliability. First, Centaur is moved to a hanger for receiving inspection. If all is well, the rocket is then taken to the launch complex where more testing is done. Additional testing and inspection is necessary to assure that the rocket is in perfect operating condition. The slightest malfunction could cost the entire mission. Because the Centaur operates with a first stage, integration tests must be conducted to make certain that the two stages are compatible. When everything checks out, the rocket is prepped for launch. The entire testing procedure takes weeks to complete. About four days prior to launch, the Lewis rocketeers would form a tiger team of specialist down at the Cape. Numbering some 30 experts – they also form the launch team itself – they would do a walk-down inspection of the mated rockets on the pad. Starting at the top, they would come down the gantry and do a complete inspection, using a checklist of what to look for in addition to the normal procedures. The tiger team subsequently would run through a demonstration countdown, do a simulated mission to check all software and test the engines to within one second of liftoff. Then they would put the rocket back into start condition for the flight. For almost 30 years, Lewis was responsible for the technical and cost and schedule management of the Centaur rocket. During that period of time many changes were made that have evolved the Centaur rocket into a workhorse for NASA. This program, since its first launch, has had an extraordinary operational success record. It was developed as an upper stage launch vehicle to be used with a first stage booster rocket, the Atlas rocket. Centaur’s first mission objective was to send the unmanned Surveyor spacecraft to the Moon. In preparation for the Surveyor mission, eight experimental flights were conducted during a four year period. Technological improvements were made after each test flight. Perhaps the worst moment in the Centaur program probably came in 1965 with the explosion on the pad with the AC-5 development flight. The vehicle and the pad were lost. The challenge was to find out what went wrong, correct it, and successfully complete that portion of the program. In May of 1966, Surveyor 1, an unmanned lunar space craft was launched. It was our first soft lander on the moon. Surveyors collected data on the moon’s surface texture and provided high resolution photographs of the surface. This knowledge was vital to the success of the later Apollo manned lunar landing missions. In the 1970’s, Centaur was combined with the Air Force Titan III booster to provide a capability to launch larger spacecraft. Together, with Atlas and Titan boosters, Centaur served as the upper stage for probes and fly-by’s to other planets, to Mercury, Venus, Mars, Jupiter, Saturn, Uranus, and Neptune. The Mariner, Pioneer, Viking and Voyager spacecraft have provided invaluable data on these planets. Close up pictures of Mars and information gathered by the spacecraft instruments, have enabled us to study the planet’s weather and the nature of its atmosphere. High resolution pictures sent to us by Voyager on it’s Grand Tour surprised us with worlds of unexpected complexity. These findings may help explain the unique features of these planets and answer questions about their evolution and about the origins of our solar system. Centaur launched orbiting observatories to study space beyond our solar system in the search for knowledge about the universe. The Orbiting Astronomical Observatories, or OAO’s, were launched in the late 1960’s and early 1970’s. OAO discovered a hydrogen cloud one million miles in diameter surrounding a comet. This was the first observational evidence that such clouds exist. OAO also observed extragalactic nebulae and the ultraviolet region of the electromagnetic spectrum, observations not possible from earth. In the late 1970’s the high energy, orbiting, astronomical observatories, or HEAO’s surveyed the heavens to pinpoint sources of cosmic and gamma rays. Centaur has launched various communications satellites into geo-synchronous orbit, 22,000 miles above the earth. The Application Technology Satellites, or ATS, were launched in the late 1960’s, this was followed by INTASAT, Comstar, and FLTSATCOM satellites throughout the ’70’s and ’80’s. These satellites are key links in the world’s communication network. Private industry has provided engineering and support activities since the initial development. Companies such as General Dynamics Corporation, Teledyne, Pratt and Whitney Aircraft and Honeywell Incorporated, have worked in cooperation with NASA in designing and improving this launch vehicle. Today, rather than managing the design, development, and launch operations, NASA procures commercial launch services. NASA Lewis continues to support industry by developing and testing new technologies and hardware through cooperative programs. A new era began the launch of the Combined Release and Radiation Effects Satellite on a commercial Atlas I in July of 1990. Centaur has also helped launch several GOES weather satellites. Centaur continues to support scientific missions such as SOHO, which launched on Atlas/Centaur-121 on December 2, 1995. This was NASA’s first use of this commercial version of the Atlas IIAS rocket. Centaur flew again on top of a Titan booster in October 1997 to launch Cassini on its way to Saturn. Although its name is not used in the commercial Atlas family of launch vehicles or the Titan IV, the Centaur continues to serve as America’s most powerful upper stage.